In this world of spreadsheets, smart phones, apps and calculators, you may ask does anyone ever need to estimate an answer when, with a few clicks, they can have the exact answer? But the ability to estimate is as important as ever: mental arithmetic hasn’t gone away and the ability to get a ‘ball park figure’ answer to a question is a skill that will prove valuable throughout life. And anyone applying for any remotely numerate or analytical job or University course would do well to familiarise themselves with “Fermi Questions” – questions that rely on ‘ball park estimates’. So I’ve created a game: Estimate the Answer to help you, or your class or children, to practise their estimating skills. 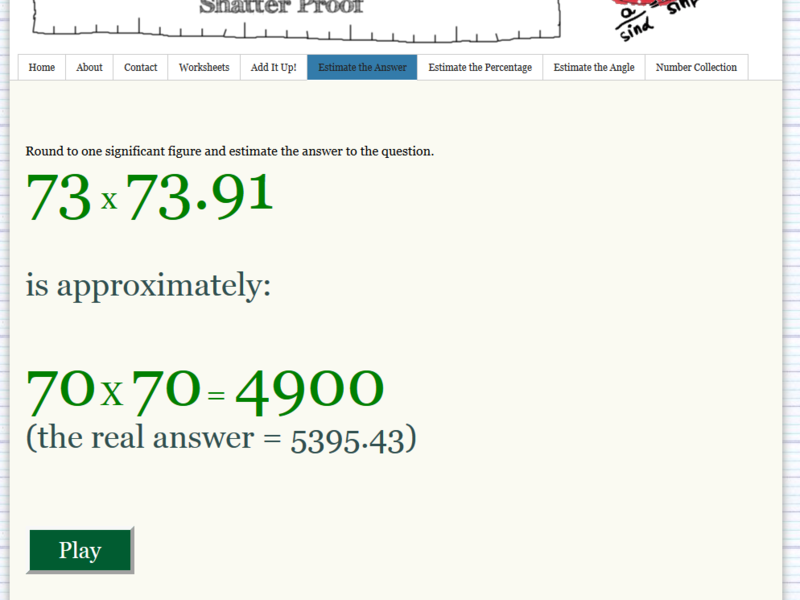 Then click the red “Answer” button and the estimated answer – along with the actual answer – will appear on the screen. Press the green “Play” button when you’re ready for the next round. Hopefully you’ll find the game useful and simple – I’ve designed it so it looks good on an Interactive Whiteboard, but works just as well on a PC, lap-top or Mac. This entry was posted in Games, Numeracy and tagged estimate. Bookmark the permalink. Post a comment or leave a trackback: Trackback URL.